IASA / NYCJava – thanks for having us by! 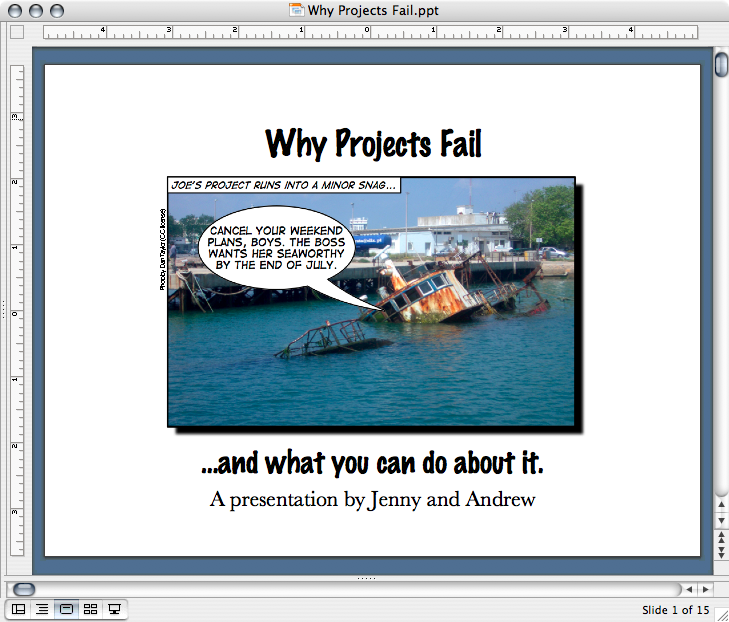 Jenny and I had a great time doing our “Why Projects Fail” talk at a joint meeting between the International Association of Software Architects and NYC Java SIG (a couple of announcements) at the Microsoft office in midtown Manhattan last night. (Fun trivia fact: my first job out of college was in the same building, working as a programmer at EMI-Capitol Records.) It was an after-work session, so we’d only expected to spend half an hour or forty-five minutes, but we got so many great questions from people that we kept going until the folks at Microsoft had to close down the meeting room. A few of you had questions about estimation, specifically the Wideband Delphi process that we’ve had a lot of success with. You can read about it in Chapter 3 of our first book, Applied Software Project Management— here’s a link to a PDF of the chapter [PDF]. We give a pretty detailed description of exactly how to hold a Wideband Delphi meeting, and how you can use it on your own projects to improve how they’re estimated. I think a lot of the questions near the end of the talk about open source projects were answered in our ONLamp.com article called “What Corporate Projects Should Learn from Open Source”. Also, here’s a link to the “What Makes Open Source Projects Work” presentation I gave last January at the SD Best Practices India 2007 conference. No, we don’t have an official release date for “Head First C#” yet, but we’re definitely making good progress on it. Keep watching this blog — as soon as O’Reilly has an official release date for it, we’ll post about it. And yes, it is really fun to write a Head First book. After the talk, a few people asked about our availability to come in and do training. Our consulting schedule is a little tight because of our pretty aggressive writing schedule for O’Reilly, but we do have some availability. You can use our “Contact Us” page to get in touch with us about consulting and speaking — serious inquiries only, please. We’re always happy to answer questions about anything we talk or write about. Feel free to get in touch with us any time! < Previous Critical path method drill — boost your PMP exam score! Head First Agile is a highly visual brain-friendly guide to help you learn important agile concepts and ideas. It covers Scrum, XP, Lean, and Kanban, and it also helps you prepare for the PMI-ACP certification. Learning Agile is a comprehensive guide to the most popular agile methods, written in a light and engaging style that makes it easy for you to learn. Read the first chapter for free! Head First PMP gets you prepared for the Project Management Professional certification exam by helping you become a better project manager. Head First C# is one of the most popular books for learning C#. In our opnion it's the easiest and most fun way to do it, too! Applied Software Project Management helps developers and project managers build better software by diagnosing and fixing the most common project problems. Beautiful Teams: Inspiring and Cautionary Tales from Veteran Team Leaders is a collection of stories and interviews with veteran team leaders that takes you behind the scenes with some of the most interesting teams in software engineering history.